AFC Wimbledon scored twice in the final five minutes to seal a comeback win over Notts County. County started brightest with Genaro Snijders and Adam Campbell coming close before Haydn Hollis headed in Graham Burke's free-kick. Dannie Bulman equalised as he fired home George Framcomb's cross into the County net at the back post. 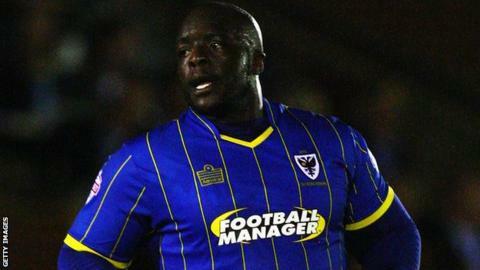 Adebayo Akinfenwa then scored a late winner for the hosts, as he headed in Adebayo Azeez's cross. "I didn't think we had great quality, we didn't move the ball around well, we just kept going and going and going. "The boys were relentless and when you keep putting quality in there things will happen and I can't fault their character at all. "Momentum is built from things like this so the boys are buzzing now." Match ends, AFC Wimbledon 2, Notts County 1. Second Half ends, AFC Wimbledon 2, Notts County 1. Substitution, Notts County. James Spencer replaces Graham Burke. Goal! AFC Wimbledon 2, Notts County 1. Adebayo Akinfenwa (AFC Wimbledon) header from the centre of the box to the top right corner. Assisted by Adebayo Azeez. Attempt blocked. Barry Fuller (AFC Wimbledon) right footed shot from outside the box is blocked. Substitution, Notts County. Julian Jenner replaces Genaro Snijders. Liam Noble (Notts County) wins a free kick on the right wing. Goal! AFC Wimbledon 1, Notts County 1. Dannie Bulman (AFC Wimbledon) right footed shot from the centre of the box to the top right corner. Assisted by George Francomb with a cross. Attempt saved. George Francomb (AFC Wimbledon) right footed shot from outside the box is saved in the bottom left corner. Graham Burke (Notts County) is shown the yellow card. Attempt blocked. Jonathan Meades (AFC Wimbledon) left footed shot from the centre of the box is blocked. Corner, AFC Wimbledon. Conceded by Haydn Hollis. Foul by Thierry Audel (Notts County). Barry Fuller (AFC Wimbledon) is shown the yellow card for a bad foul. Corner, AFC Wimbledon. Conceded by Mawouna Kodjo Amevor. Attempt saved. Adebayo Azeez (AFC Wimbledon) right footed shot from outside the box is saved in the bottom left corner. Attempt saved. Liam Noble (Notts County) right footed shot from very close range is saved in the top centre of the goal. Genaro Snijders (Notts County) is shown the yellow card for a bad foul. Foul by Genaro Snijders (Notts County). Substitution, Notts County. Liam Noble replaces Adam Campbell. Attempt missed. Adebayo Akinfenwa (AFC Wimbledon) header from the right side of the six yard box is too high following a corner. Foul by Mawouna Kodjo Amevor (Notts County). Substitution, AFC Wimbledon. Adebayo Azeez replaces Tom Elliott.